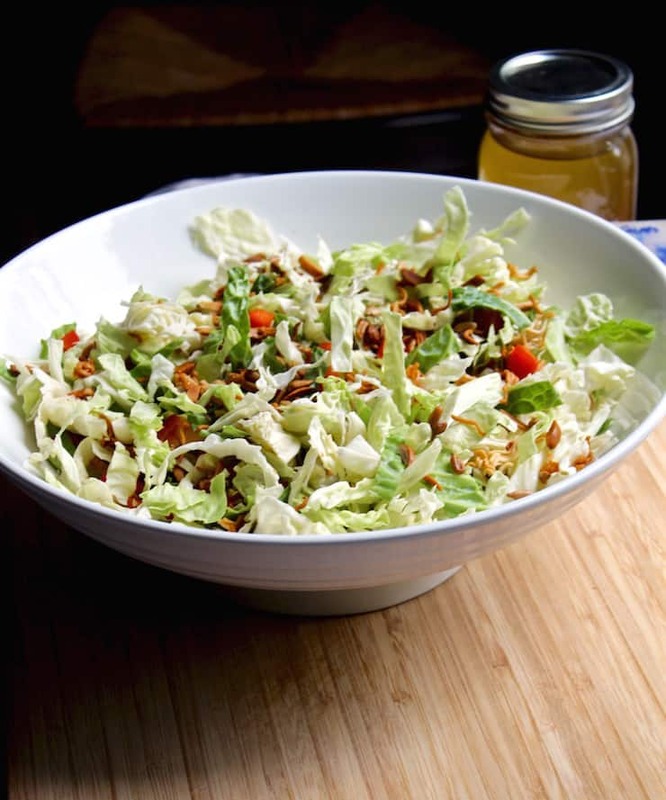 Asian ramen noodle salad, crunchy chopped napa cabbage with toasted ramen noodles and nuts in a sweet soy dressing. 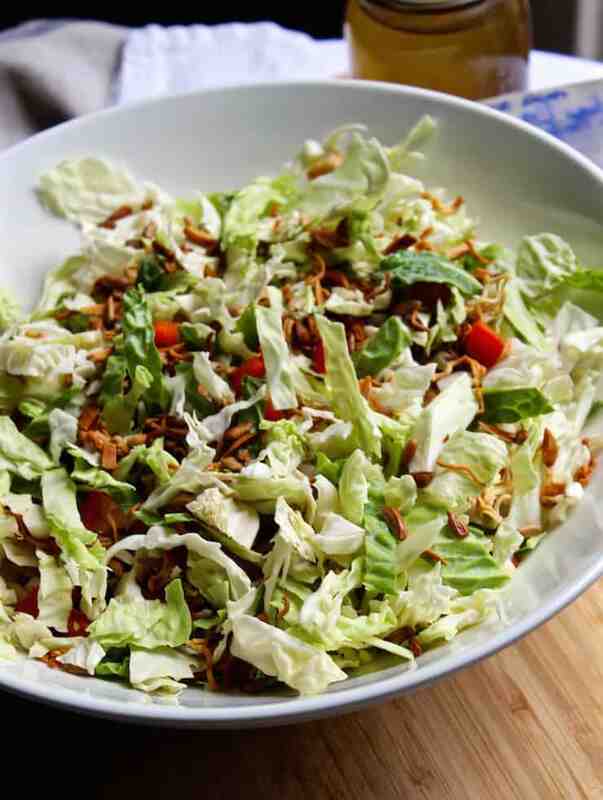 The best version of that slaw recipe with the ramen noodles you’ll ever have ~ fresh, flavorful and a hit at gatherings. 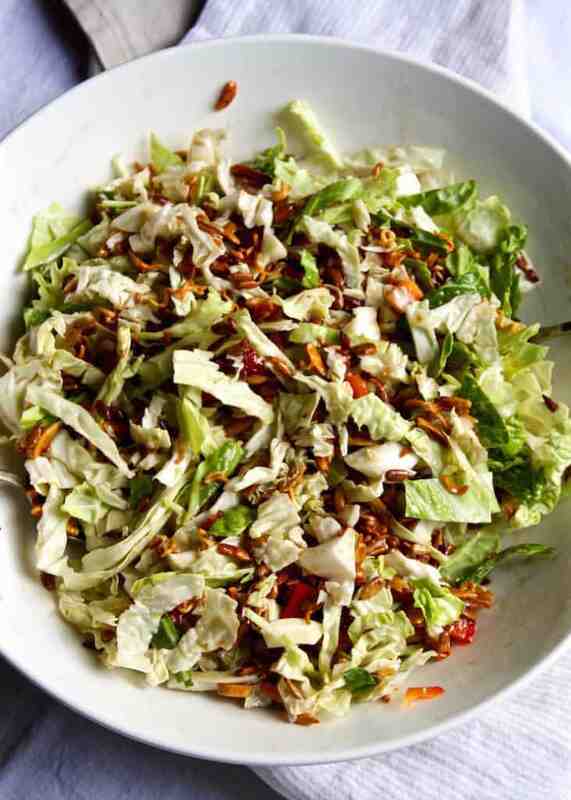 Do you guys remember (or still make) Oriental cole slaw? I don’t think that’s PC anymore, maybe it’s called Asian slaw now. Anyway, it had the ramen noodles from the soup packets crushed up in the salad. For some reason, I think that’s strange. And then years ago, in Minnesota, a friend made a salad for a party and I had to know how he made it, it was so good. 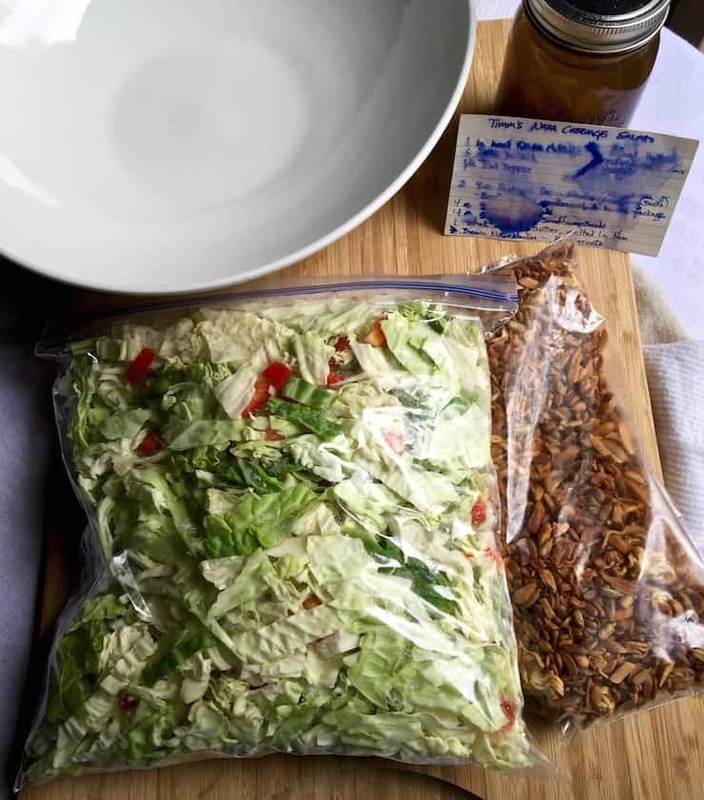 Over the recent Fourth holiday, I dusted off Timm’s Napa Cabbage Salad and made it for a BBQ. It’s still so good. When I say dusted off, I really mean I had to figure out how I made it as the recipe card Timm gave me is mostly illegible. As I do with most recipes, I have them on the counter as I’m cooking and they tend to get a little beat up, this one especially so, as it looks like the ink smeared with all the water and wet hands landing on it. See what I mean? It came back to me though, I’m pretty sure I was able to decipher and remember how to make this. It does use those ramen noodles (not the seasoning packets!) but they’re browned in butter with almonds and sunflower nuts. I had to keep swatting Meathead’s hand away as the mixture was cooling on paper towels. He thought it was granola or something and said, “This is great!” as another handful went into his mouth. Jeez. 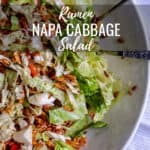 If you’ve tried this Ramen Napa Cabbage Salad, please rate it below in the comments and let me know how it went ~ I love hearing from you! HUNGRY FOR MORE? Subscribe to my Newsletter and come hang out with me on PINTEREST, INSTAGRAM and FACEBOOK for all the latest updates. 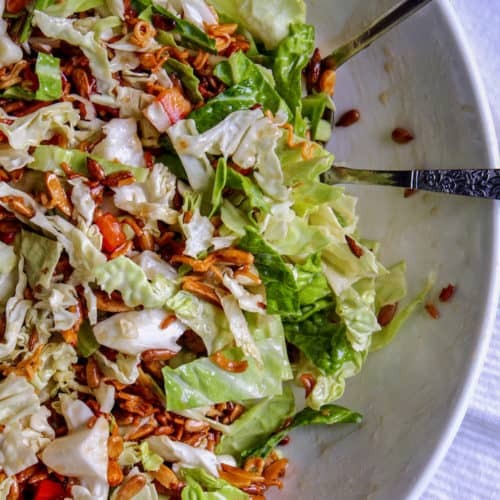 The best version of that slaw recipe with the ramen noodles you'll ever have ~ fresh, flavorful and a hit at gatherings. Combine cabbage, green onion and red pepper and put in a large plastic zip bag. Refrigerate overnight. In a large skillet, melt stick of butter over medium heat. Add crushed ramen noodles and nuts and brown. 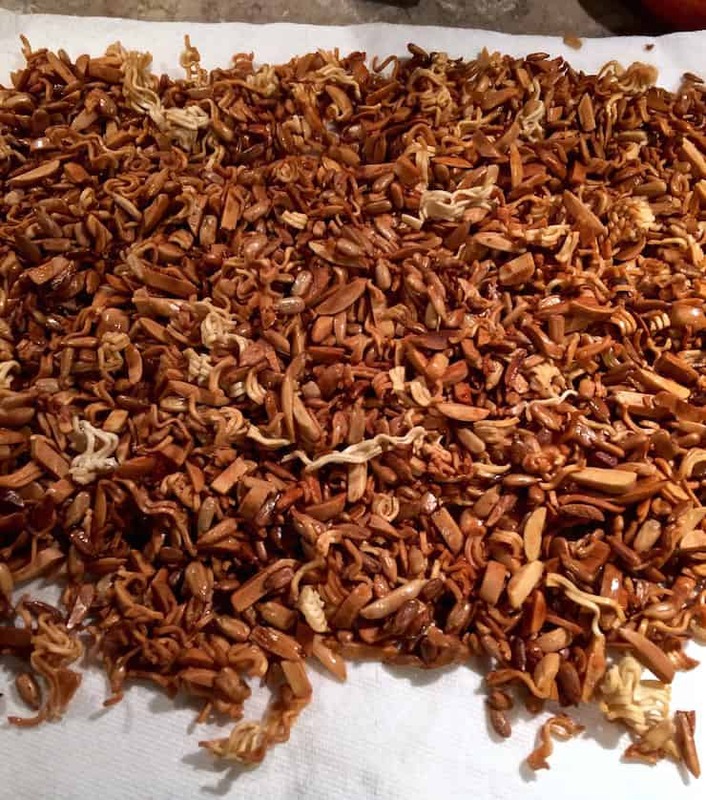 Stir frequently and be careful not to burn. Remove to paper towels to drain and cool completely. Place in another plastic zip bag and refrigerate. Two hours before serving, mix the cabbage mixture with the noodle/nut mixture. Set aside, back in refrigerator. Make the dressing: in a jar with a lid, combine soy sauce, sugar, vinegar and oil, shake well to dissolve sugar, set aside. Just before serving, dress the salad. Re-shake dressing and add as much as necessary to toss and coat evenly. 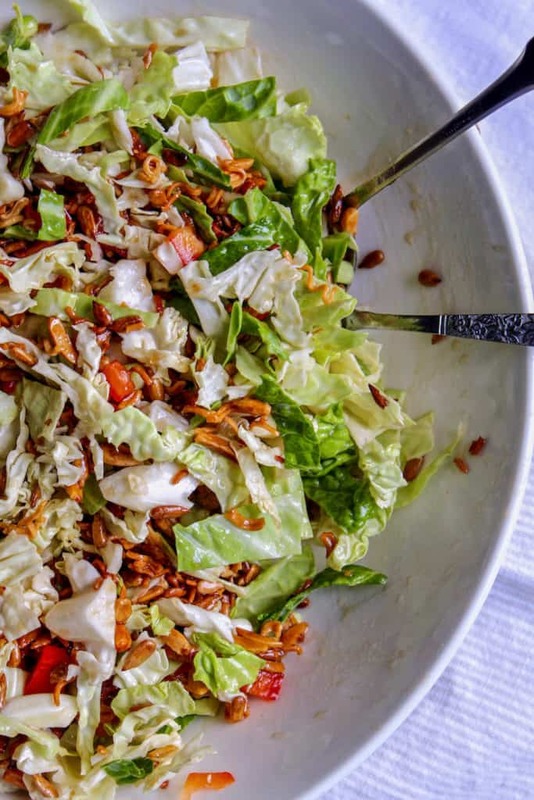 Oriental or Asian, no matter what you call it, it’s DAMN GOOD slaw!